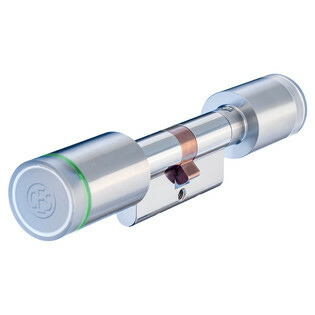 The CEMO motor cylinder is an electromotive locking cylinder (knob cylinder) which automatically locks or unlocks doors or other closure devices. It is controlled by means of an integrated electronic controller which transmits either time-related access releases or individual releases to the motor cylinder. The motor cylinder can optionally be operated from the outside with mechanical keys, entering a code, RFID media combined with access control systems, or can be released with push buttons. On the inside, it is operated with a mechanical knob or a motion detector. As it is easy to mount, the CEMO motor cylinder is often used to retrofit existing doors or closure devices. The motor cylinder is completely compatible with all mechanical CES locking systems, starting with the S4000 system. 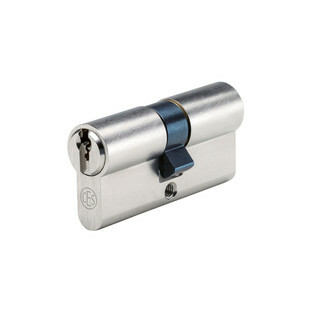 It can be inserted in all locks prepared for Euro profile cylinders and supports the operation of locks with reversible latchbolt, dead-bolt only locks, multipoint locks and locks with anti-panic function. Here, you will find more product details. When equipped with the network module, the CEMO motor cylinder can be connected to any existing IP network. This enables communication with the linked doors. 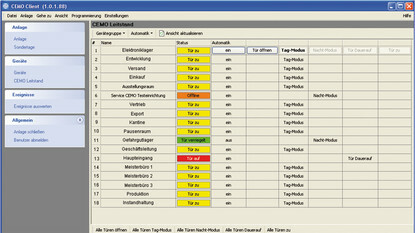 The CEStronics control terminal software allows controlling the door status, and it saves all events at the linked doors. The respective door status is shown, as well as the events at the doors. The door status can be changed at any time just with a mouse click.